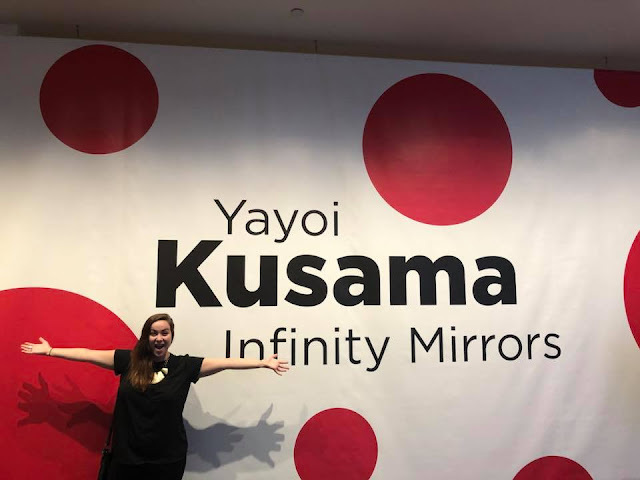 When I learned that the Cleveland Museum of Art was hosting Yayoi Kusama's Infinity Mirrors exhibit starting this summer, I pulled the trigger & bought a museum membership. 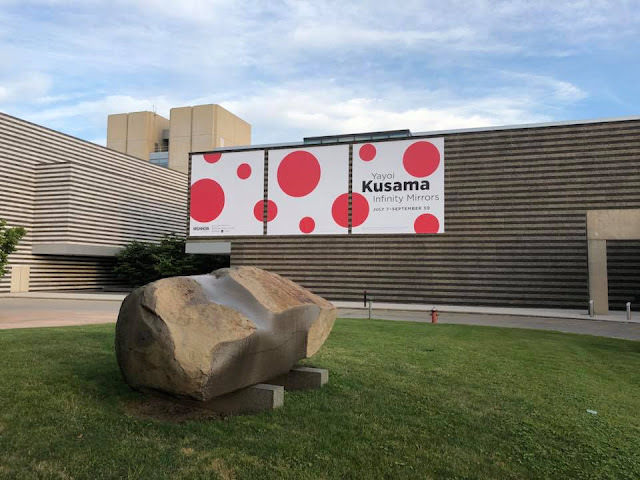 I'd been considering it for awhile, but as soon as I learned that museum members got first crack at Kusama tickets, that sealed the deal for me. The day tickets when on sale, I was in Columbus with my mom - & joined the long online ticket queue from brunch! Thank goodness for technology. 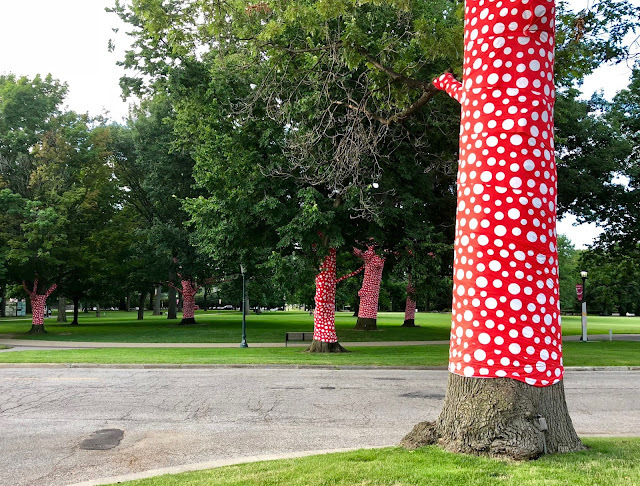 CMA has really gone all-out for this exhibit, hiring 100+ additional employees to staff it & even decorating the outside of the museum - & the surrounding trees! 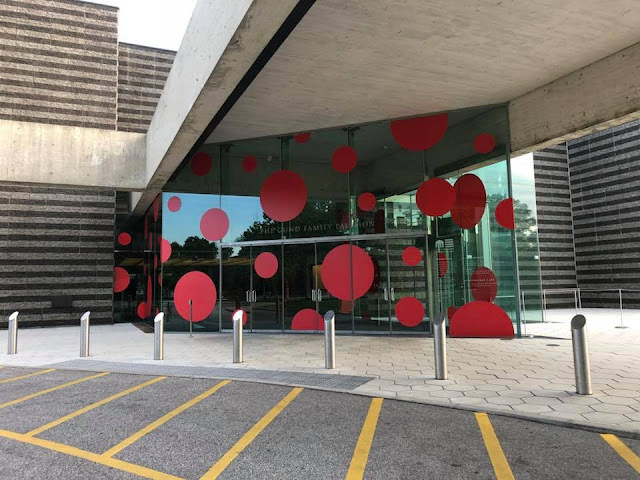 - in Kusama's signature red & white polka dots. 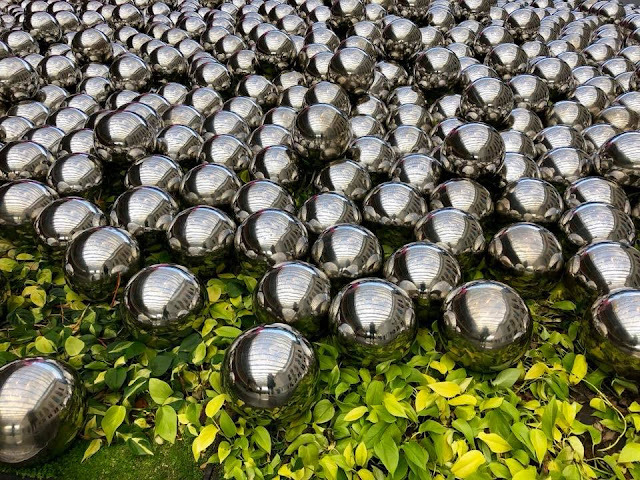 When you walk into the museum's massive, beautiful atrium area, you're greeted by the first exhibit, a field of large, mirrored balls lying in leaves. 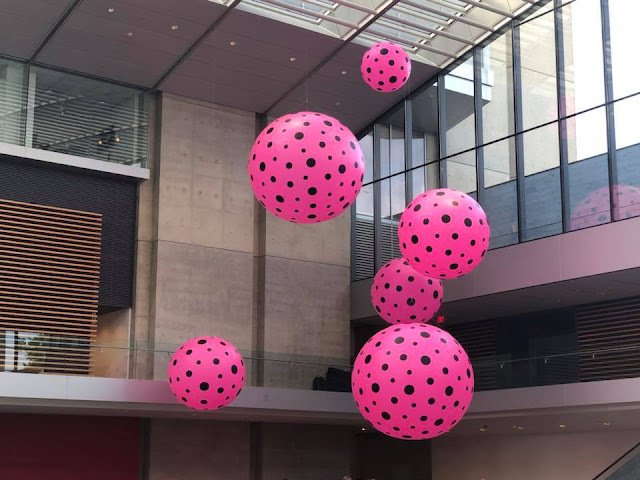 Behind it, you can see part of another exhibit - those giant, pink orbs suspended from the ceiling, which are part of an exhibit on the lower floor that extends allllll the way up. The overall effect is very cool & modern - & makes you really excited for what's to come. 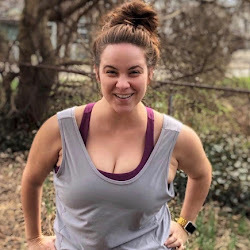 Tickets are sold in 15-minute time increments, so when you get there, you just pop into the line labeled with your assigned time. 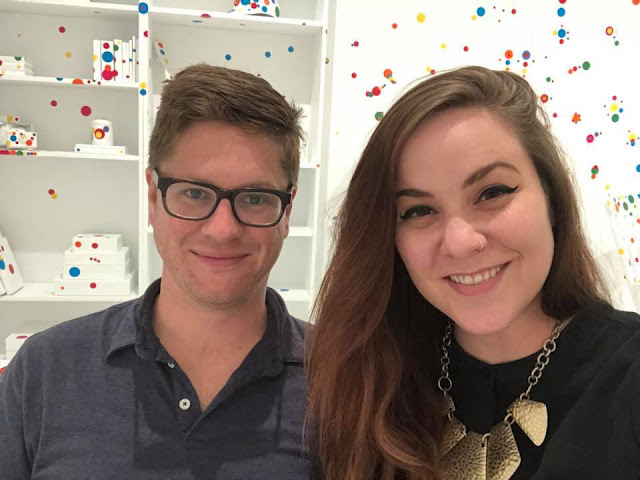 This helps ensure that the exhibit runs smoothly & isn't overcrowded - which is important considering that tickets to see this exhibit have been selling like gangbusters! 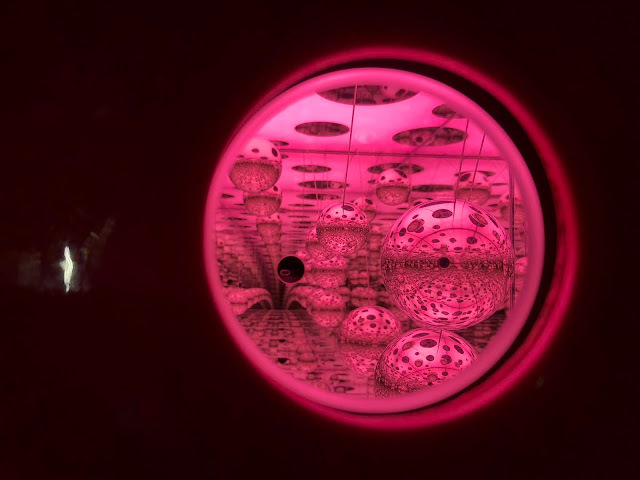 The exhibit includes a few installations you can wander & explore at your own leisure, but the real meat of it is five small, free-standing rooms that are entirely enclosed. You wait in line at each one until it's your turn for a museum employee to let you into the room for a 20- or 30-second period. Yep. Twenty to 30 seconds is all you get in each room of the exhibit - & you're not allowed to get back in line to go through again. 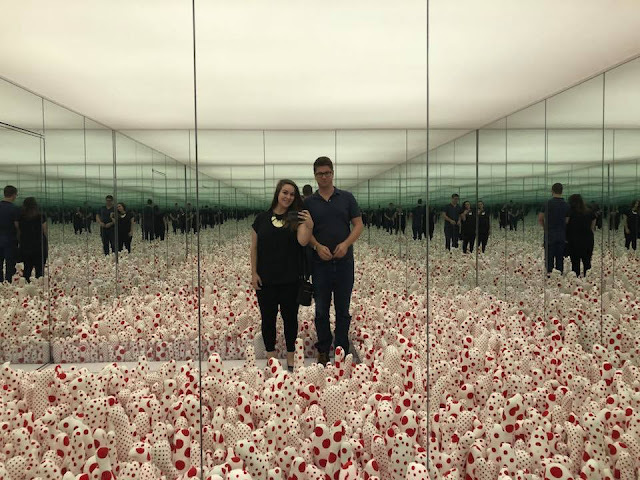 It's barely enough time for your eyes to adjust, much less to really take in the art or to photograph it, which is really disappointing but also, apparently, "the artist's intent." OK. 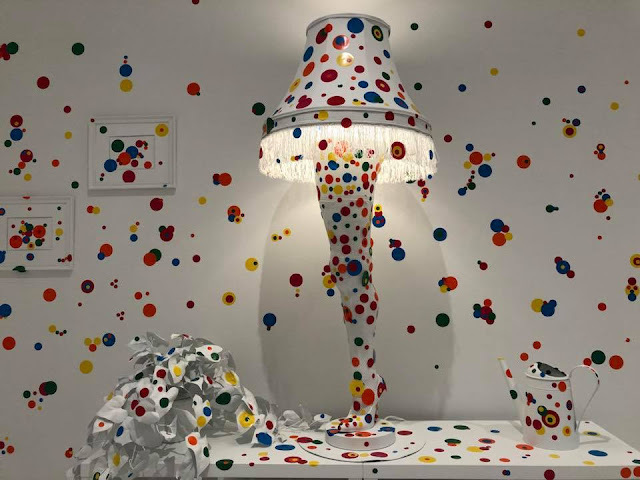 This room is... full of polka-dotted phalluses, yes. 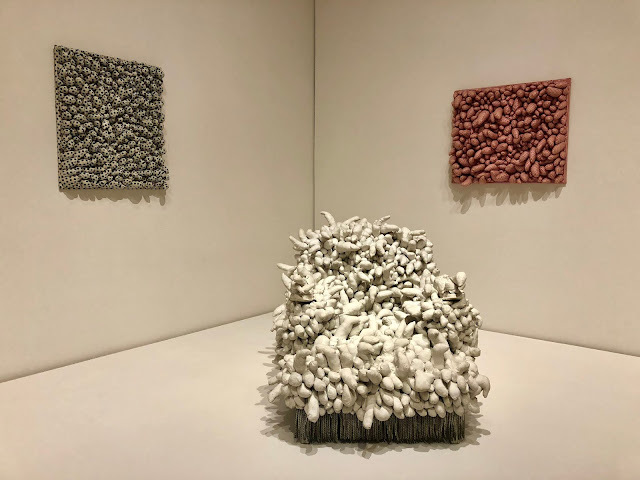 The room is called Phalli’s Field, & phalluses are made up stuffed cotton. 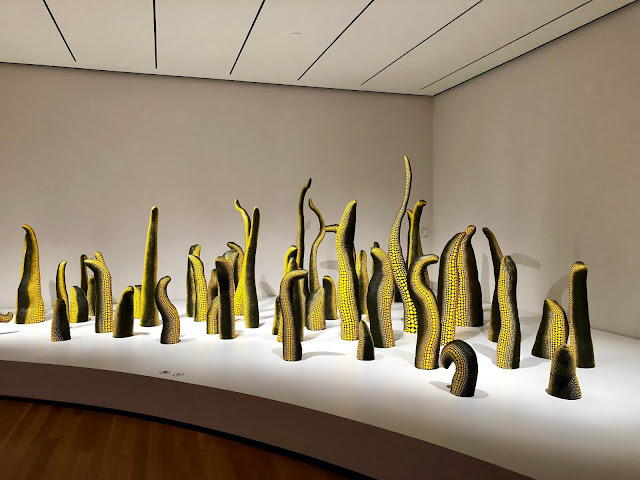 They look like wacky barnacles growing out of the ground. 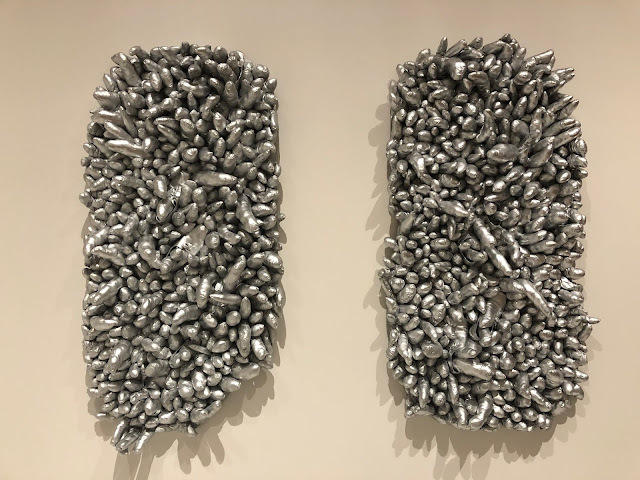 Kusama found the process of creating these tubers to be taxing, so she began to use mirrors to create the illusion of more of them. 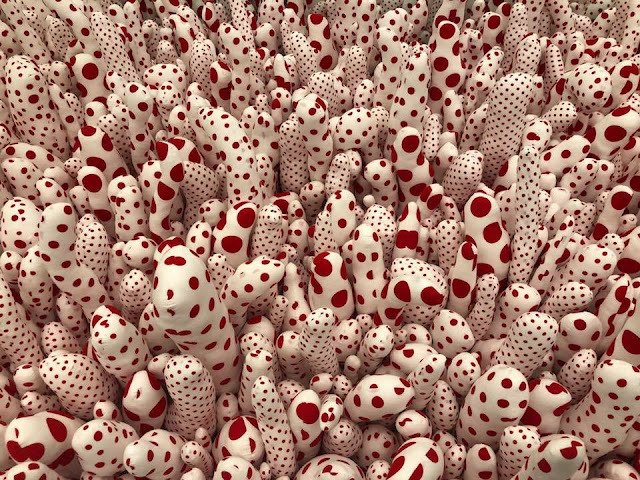 This room isn't the only place where she uses these phallic tubers, which Kusama calls Accumulations. 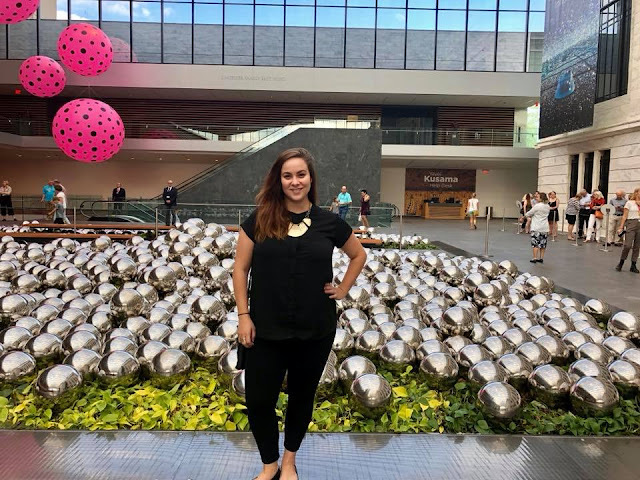 She's covered furniture in them, made hanging wall art of them, & created a garden of them that's reminiscent of the Loch Ness Monster. I didn't get great photos in the other rooms because of the time limit. More than I wanted to photograph them, I wanted to enjoy them, & I decided that was more important than being able to blog about them. None of these photos to justice to any of this art, but that's OK. Maybe that's how art should be sometimes, you know? 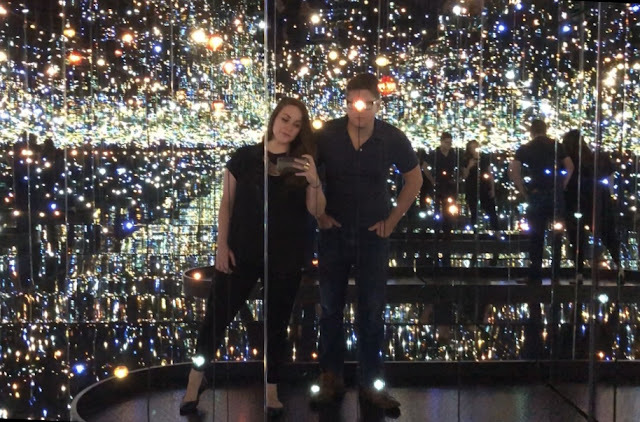 These exhibits have really dramatic names, like The Souls of Millions of Light Years Away & (that's the one with the colorful lights), Aftermath of Obliteration of Eternity (the one with the golden lanterns). 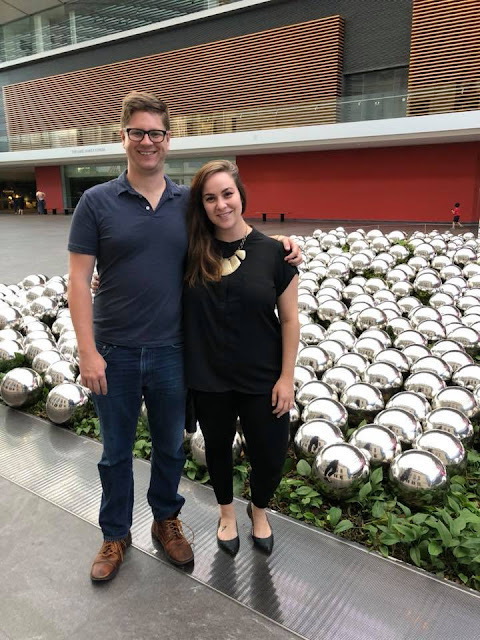 Perhaps the coolest, in my opinion, is All the Eternal Love I Have for the Pumpkins, which visitors aren't allowed to photograph (though no one explained why, exactly). 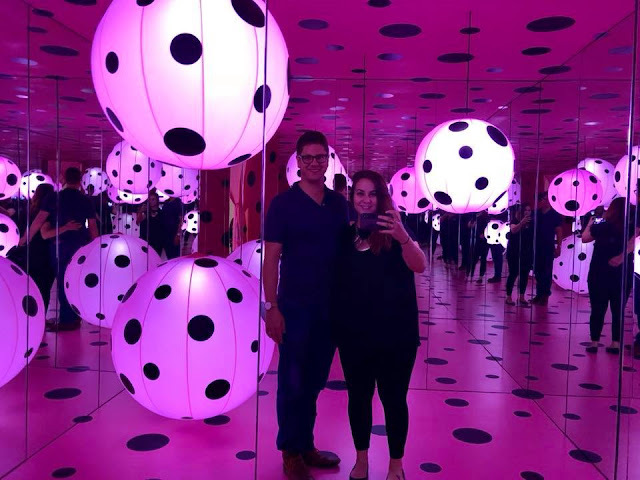 That one is full of glowing, polka-dotted kabocha squashes, & a museum staffer accompanied us into the room to be sure we didn't break the rules. One of my favorite parts of the exhibit is Love Forever, a box made of wood, mirrors, metal, & lightbulbs. 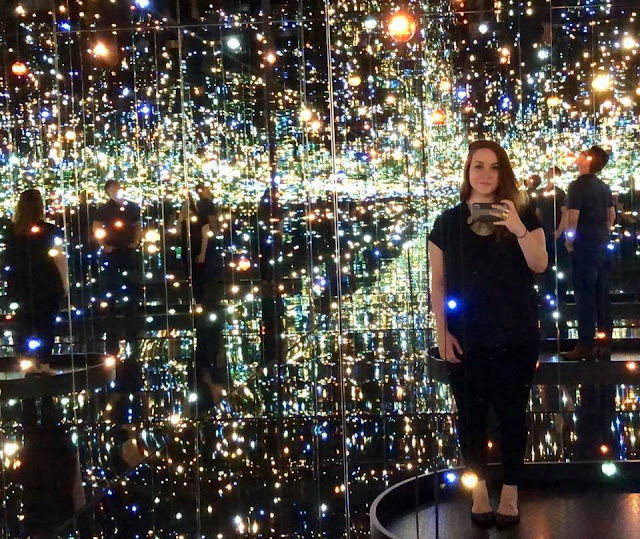 You can look in either of two holes in the side of the box to see what felt like an infinity's worth of flashing lights - like being on the inside of a kaleidoscope. I wish I could've fully captured it in photos, but this will have to do (unless you want to check out other people's awesome Instagram videos of it). 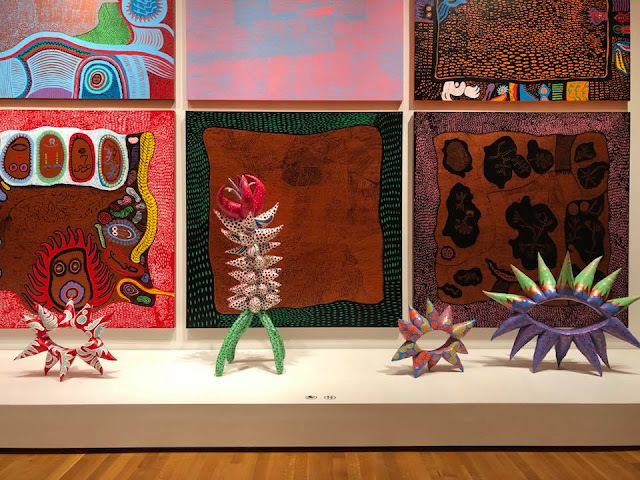 The description of this exhibit says, "For the artist, the concept of 'Love Forever' stood for civil rights, sexual liberation, the antiwar movement, and the activist groups of the 1960s." Heyyy, social justice art! As much as I loved looking in the box, I really loved watching other people look in the box. Everyone just seemed so joyful as soon as they popped their heads inside. 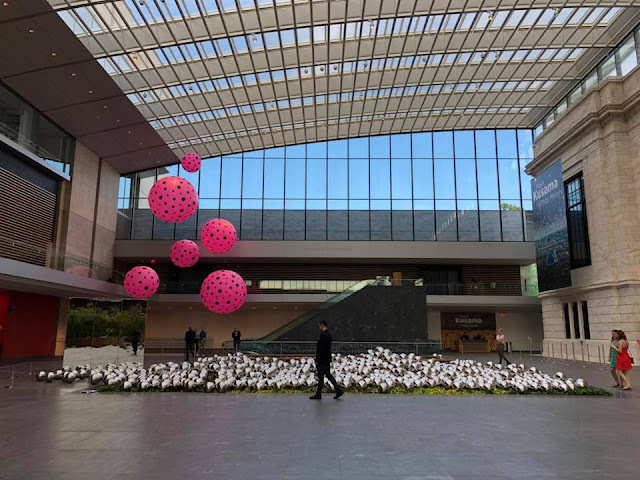 And how about those giant pink orbs? 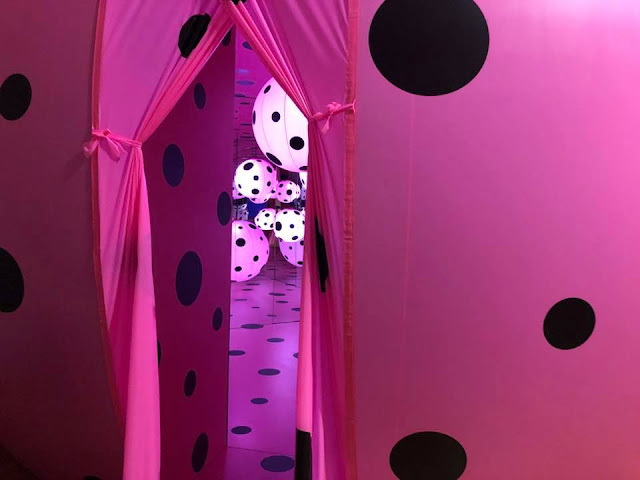 That exhibit is called Love Transformed Into Dots, & it has a very stuck-inside-a-dollhouse feel. There's a 20-second room full of them, but they're also all over the rest of the exhibit so that you can see them up close. They're inflatable... & enormous. There's also a small version of them. 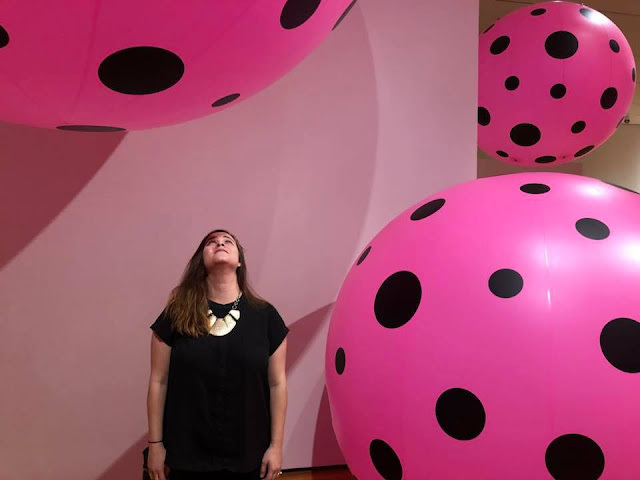 You peek through a tiny hole & see hundreds of thousands of tiny pink orbs, mirroring off one another, forever. 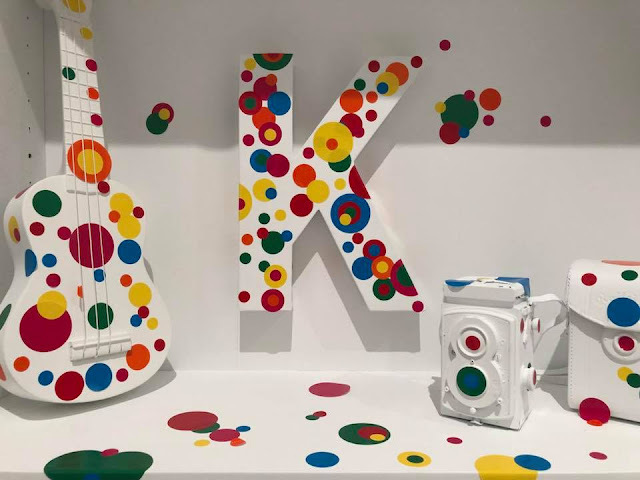 These very colorful displays are both 1D & 3D, & they represent Kusama's more recent work - as recently as 2016, in fact, which is kind of amazing given that she's 89 years old. Did you hear me? 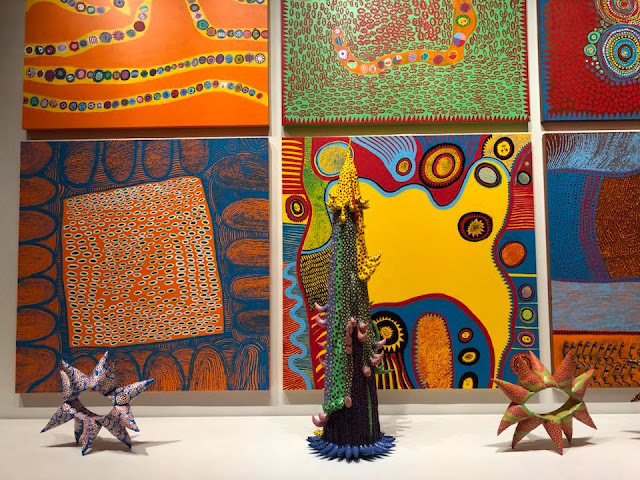 She is 89 years old creating all these amazing, glorious, intricate artwork, proving that ain't nothin' but a number. The final room of the exhibit is one that's fully interactive & where visitors can spend as much time as they want. 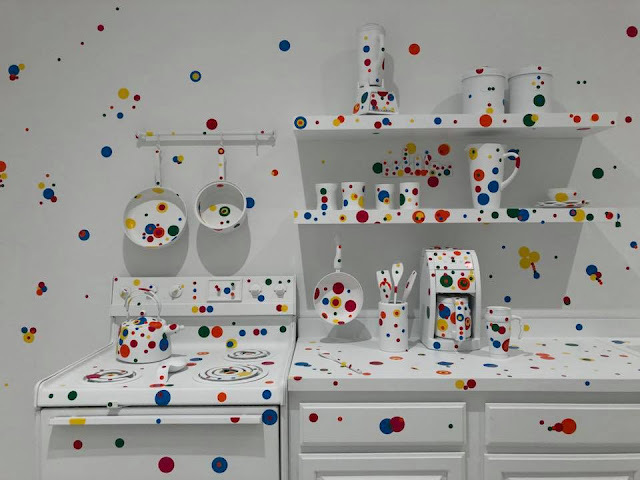 The Obliteration Room, set up like a home - complete with a kitchen, a library, an office, & more - is painted entirely in white, from floor to ceiling & everywhere in between. 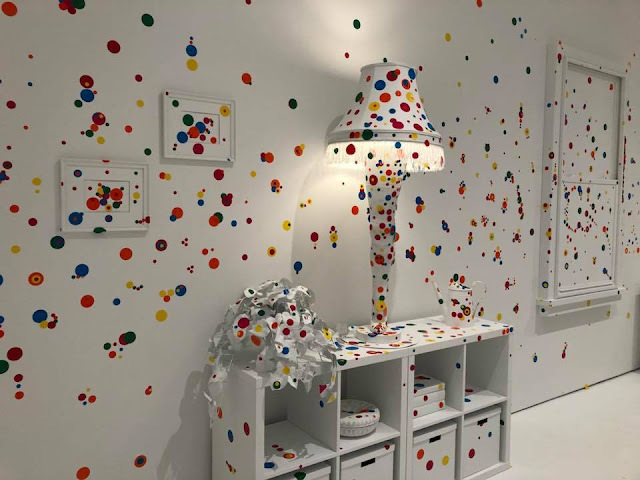 When you enter the room, a museum attendant hands you a small sheet of colorful polka dot stickers, with instructions to stick them wherever you want (except on the ceiling). 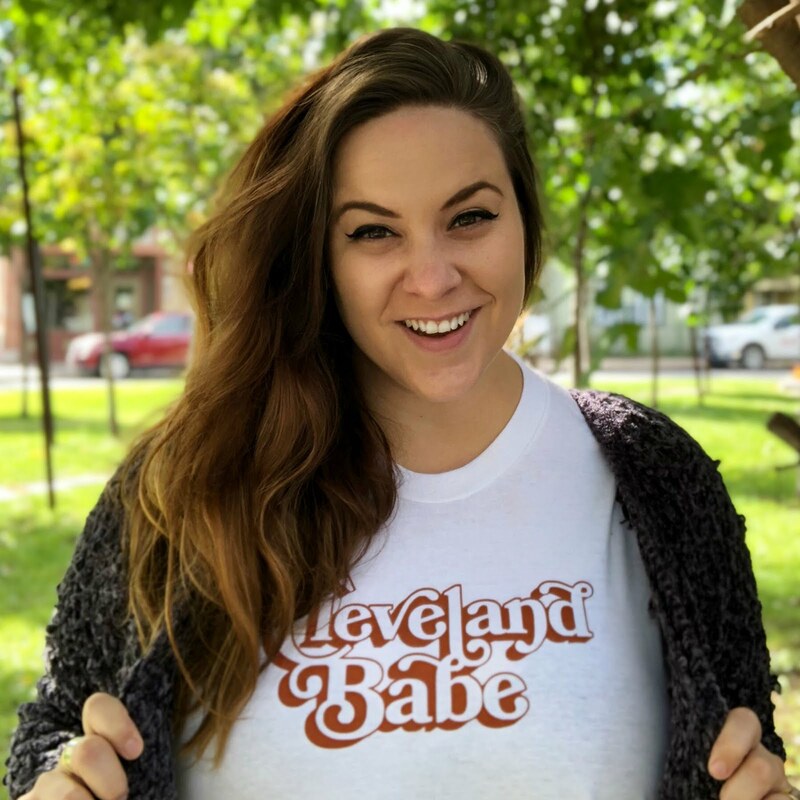 I especially love the Cleveland touches, including a leg lamp a la A Christmas Story & the Cleveland skyline above the sink. 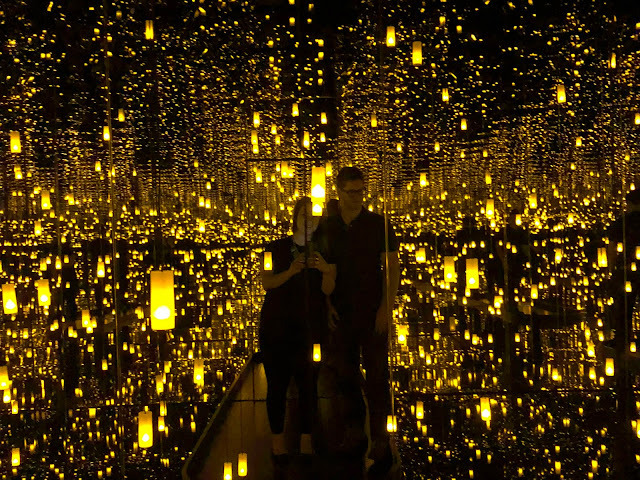 I wanted to take more photos in here, but Mike didn't want to disrupt anyone else's experience - perhaps because of what happened the last time we went to a Kusama exhibit! 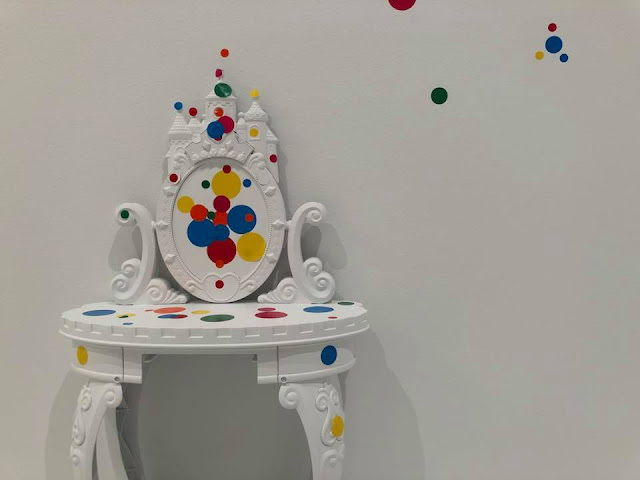 Yayoi Kusama has been making art for a damn long time, but it's only in the past few years that she's been truly recognized & respected for the breadth of her work. She's achieved cult status - at nearly 90 years old! 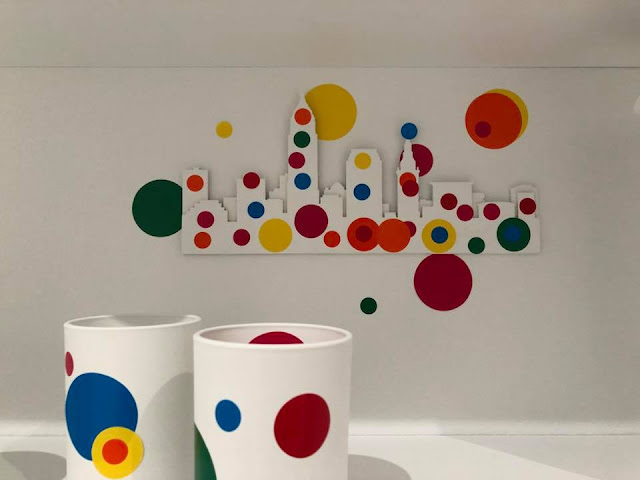 She lives in Japan, where she continues to make art shown around the world, including a new upcoming exhibit in London. 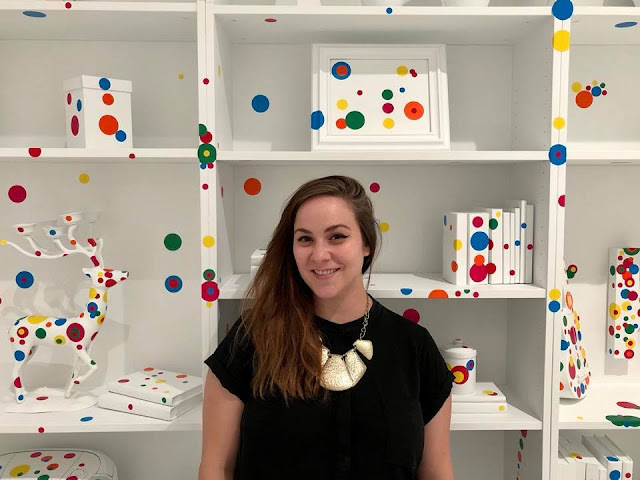 "I love painting so much that nothing else matters," she said in one interview. I felt so lucky to be able to score tickets to this exhibit - & I'd like to go again, if I can manage to get a second round of tickets. If you're able to go, I can't recommend it highly enough. 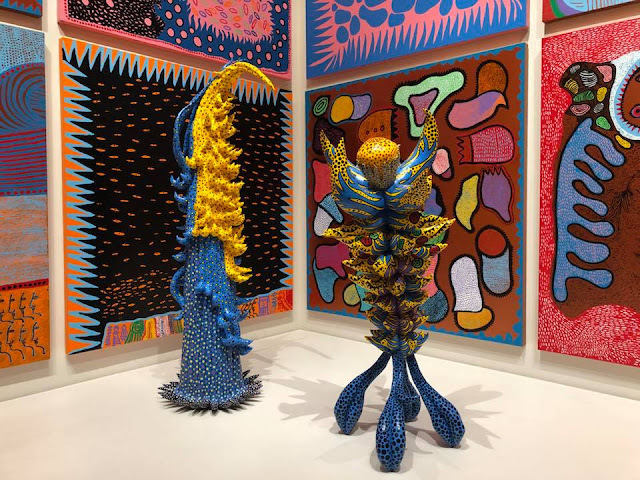 Though Kusama's art is said to be inspired, in part, by her severe psychiatric issues, they manifest themselves in such a way that you can't but feel joyful & full of awe when viewing her work.